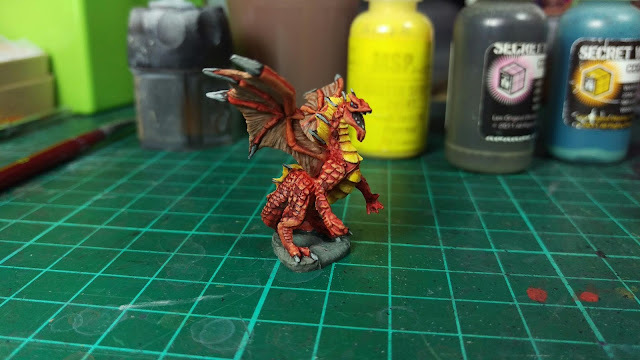 Quick pictures of the Reaper Bones Dragon Hatching I finished last night. Tabletop quality, so I haven't fussed doing fancy photos. I have a few more of these to paint, and I'm going to try a few different things with them in the future. Lots of fun for a quick job, and now I have a new tiny friend :D.
Painted using Reaper MSP, Secret Weapon Washes, and Broken Toad brushes. Last year I was burned out from trying to paint Gencon entries. I never got any of my planned entries done, and while I was doing that, I was slowly getting annoyed at any progress I did make. A friend suggested that I paint something for fun. I found this little Shrike sitting on my desk and cleaned him up while I was watching a moving. Then glued him to a base with texture, and undercoated him. Cause "Surely I'll paint him when I am back from the States...", I thought. An hour later I had done a wash on him to bring out the details, which I had recently heard of again and wanted to try out. Two days later I messaged my friend that I was painting a bit more of the model each night. It broke me, in the best of ways. Back again with more photos! This time round are the Terror Tots that I did for my Lilith crew. 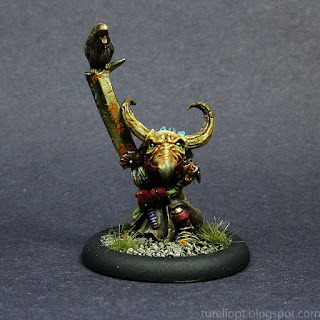 I'll also talk about what I was doing with the bases and minis a bit during this. Terror Tot 1. While these were all painted together, they each gave me a chance to do some things I had not done before. Number 1 gave me a chance to work on some weird curved blades, so I got to mess around with the coloured metallics I was doing in a different circumstance. I also was trying a different way of doing bone colour that I had heard previously from Georc. Mixing two complementary colours like a yellow bone and dark purple (Like I used on the skin) gives a muted colour, so you can fade between the two easily. This let me try working some purple shade into the bone.